To be more specific, I'm working on some posters project, and I need mockups. I have one showing one A3 frame with one smart object inside. Now I need mockups for set of 2, 3, 4, 5 and 6 posters. I've tried to make one for set of 3 posters, I duplicated original frame, and when I positioned the first poster and saved, it was shown on all 3 frames. 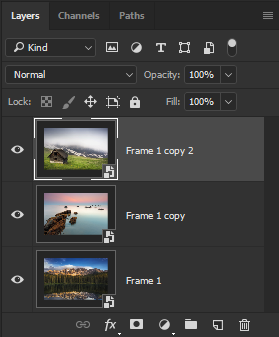 I've tried not duplicating but copying (New Smart Object via copy) smart object and placing it into other 2 frames but with no success. I'm pretty sure this can be done, but I just don't know how. Any help welcome. Thanks. You're on the right track... Not sure what you're doing wrong. Right-click on your Smart Object layer and choose 'New Smart Object via copy'. Double-click on the Smart Object layer thumbnail and place your individual images (File > Place...) behind your frame. Not the answer you're looking for? Browse other questions tagged adobe-photoshop smartobject mockup or ask your own question.